I’m sure everyone is aware of the recent Supreme Court decision legalizing homosexual marriage across the nation. If you have turned on a TV or logged on to the internet in the past few days you are also aware of the outpouring of opinions from people on both sides of the issue. While the issue of homosexuality is an important and pertinent topic of discussion, and one of which I am convinced that Scripture is very clear on, it is not the topic I want to discuss now. I want to talk about something that I believe is a little deeper and that some people may not even realize yet. That something is persecution. When was the last time you thought about persecution? When was the last time you thought about it in the context of you or your family being persecuted right here at home? Sadly, I must confess that this is not a topic that I meditate on often. This is not something that we experience very often here in the United States, at least not blatantly, and we have taken that freedom for granted. I believe that is freedom that we will find more and more lacking in the coming years. The legalization of homosexual marriage is not the root issue. After all, homosexuality is simply an expression of sin that is no different from adultery, divorce, promiscuity, lust, or gossip. All of which carry the same punishment; namely eternal separation from God in Hell! All of which also carry the same solution; namely repentance of sin and faith in Jesus Christ as Lord and Savior! Trusting in His work on the cross as payment for the penalty of our transgression! The root issue is rebellion against a Holy God. The recent ruling simply marks a societal acceptance, and even an applauding, of that rebellion. It marks a nation that is abandoning the absolute authority of God and His Word, “exchanging the truth of God for a lie” (Romans 1:25), and each man “doing what is right in his own eyes” (Judges 21:25). I have wept over the state of our nation, and the state of the church as many professing Christians have compromised, and even twisted, God’s Word attempting to justify their own sinful lifestyle or condone the sinful behavior of another. It is this societal acceptance of sin that will cause any who hold firm to the truth of the Bible and the absolute moral standard set forth by God to find ourselves increasingly in the minority. I have already seen some people calling for the removal of any freedom of the exercise of religion by any organization or person that may be deemed discriminatory. I am seeing Christians being called bigoted, hateful, discriminatory, unloving, and judgmental among other things, some of which I dare not repeat. This condemnation of Christians is coming from society as a whole, and it is also coming from friends and family. People are already losing family, friends, jobs, and personal businesses because of their faith in Jesus and it will only get worse from here. So, how do we respond to this persecution when it comes? We rejoice! Matthew 5:11-12 says, “Blessed are you when they insult you and persecute you and falsely say every kind of evil against you because of Me. Be glad and rejoice, because you reward is great in heaven. 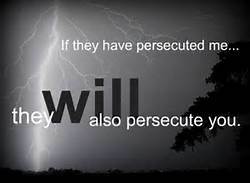 For that is how they persecuted the prophets who were before you.” We are able to rejoice in the midst of persecution knowing that we are not the first or only ones to be persecuted, but most importantly because the persecution is temporal and our eternal reward in heaven is great! We are patient! 1 Corinthians 4:12 says, “When we are reviled, we bless; when we are persecuted, we endure it”. We do not respond to adversity as the world does. We bless those who curse us, we love our enemies, and endure persecution with much longsuffering. We glorify God! “But if anyone suffers as a Christian, he should not be ashamed, but should glorify God with that name”, 1 Peter 4:16. Everything, even our suffering and persecution, is ultimately for the glory of God. If we find ourselves in persecution of any form let us glorify God in it; responding in a way to be counted worthy of being called a follower of Christ. We pray! Jesus tells us to love our enemies and pray for those that persecute us (Matthew 5:44). He also set the example for us. We find Jesus in prayer anytime He faced trial and tribulation. If Christ, who is God manifested in flesh, found it important to pray and depend on the Holy Spirit in times of persecution, how much more dependent should we be in our fleshly weakness! We should not be surprised when persecution comes, after all Jesus warned us it would (John 15:20). We should not even be surprised if it comes from people who claim the name of Christian (Acts 20:29-31, 2 Timothy 4:3-5, 1 John 2:19). If we walk in the footsteps of Jesus persecution is inevitable. Are you ready?